With summer in full swing and 4th of July just around the corner, many will be enjoying spending time with family and friends and hosting parties and family reunions. 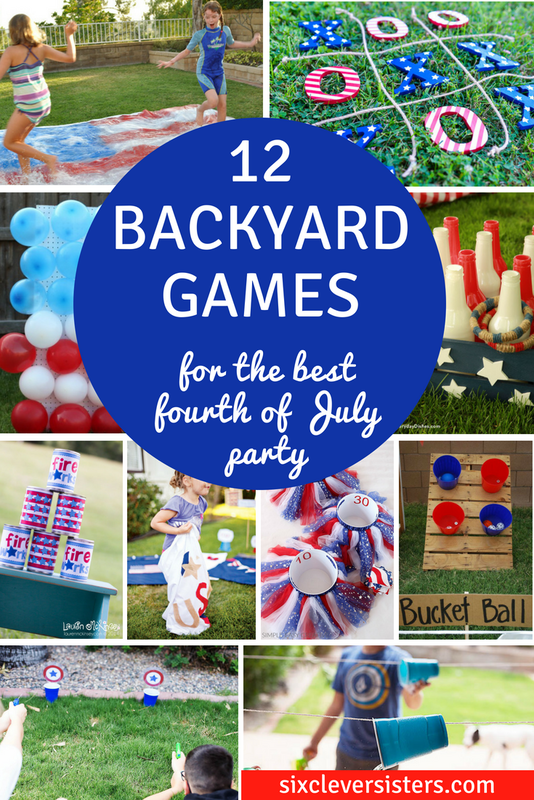 What better way to spend the 4th of July than hanging out in the backyard enjoying some backyard games together and creating some great memories! These 12 great game ideas will bring the FUN to the party! And a good party always includes good food! Mariah shares with us how to make this large dart board game that brings out the giggles! I love that she fills the balloons with special treats, too! It even doubles as a great photo backdrop. I love that this is portable and can be taken to the park, beach or another friend’s house! Hobby Lobby has a great tutorial on this festive looking family fun game! Liz shares with us this great no sew project that can be made in just minutes. You can take it along with you to keep the kids occupied while you’re waiting for the fireworks to start! Thanks, Pauline, for a great crazy fun water game that all ages can enjoy! You probably have everything around the house for this game! The printables are available to download for free, too. Cori uses her Cricut and some inexpensive wooden letters to make this traditional game. Love, love, love the patriotic look of this! Allison shares this super fun water target game that can bring on the competition! We played this as kids, but, I think it was called rattle rail toss or something. It kept us busy for hours! Sara gives us the step-by-step instructions on how to make this. An old pallet and some dollar store buckets make for an easy project! It’s your traditional, all-American sack race game with some pretty patriotic looking sacks! Jenn shares the free printable race and start and finish signs as well! Add a little more patriotic flare by having everyone decorate their own cups! This game makes for some great target practice! 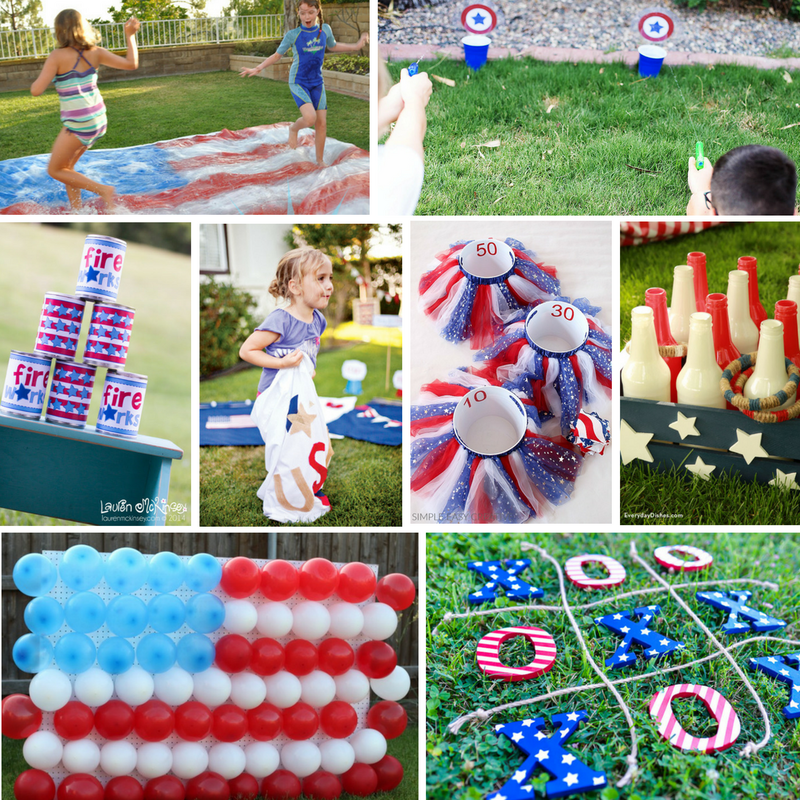 These 12 backyard games are not only great for the Fourth of July, but they are amazing activities to keep your kids occupied the rest of the summer before they head back to school! What a fun round up of ideas! Thanks for including our Bean Bag Toss!